While this map is an economic mission, I intended it to be an "eyecandy". Pedoulas is a tiny village of no more than 50 (not counting soldiers and religious). Located next to the Monastery of St. John Chrysostom (the village grew around the monastery), it is a popular pilgrimage site - not only because of the awe-inspiring architecture and beautiful gardens of the monastery itself, but also because of Pedoulas's trade in prosphora. For Christians of the Chalcedonian (Eastern) tradition, the bread used in the Divine Liturgy is not a flat wafer as it is for Latin (Western) Christians. It is a real, leavened loaf called a "prosphora". And back in the day, Pedoulas made the most and best quality prosphorae of any village on the Anatolain peninsula. It also did a trade in iron, but the iron was never as famous as the bread to be broken at the Liturgy. Indeed, for Medieval Anatolian Christians, Pedoulas was a village name of great pride. The "goal" of the map is to gain gold, bread, and blessings, but really it is just a map made for looking at. I hope you enjoy it. Looks good from minimap. But...I'm in hurry...will check it out...soon...as it is written that it's an eco. 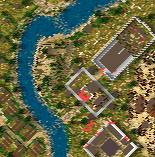 I updated the map; I forgot to make the granary accessible, so I surrounded the hill it's on with iron and boulders.